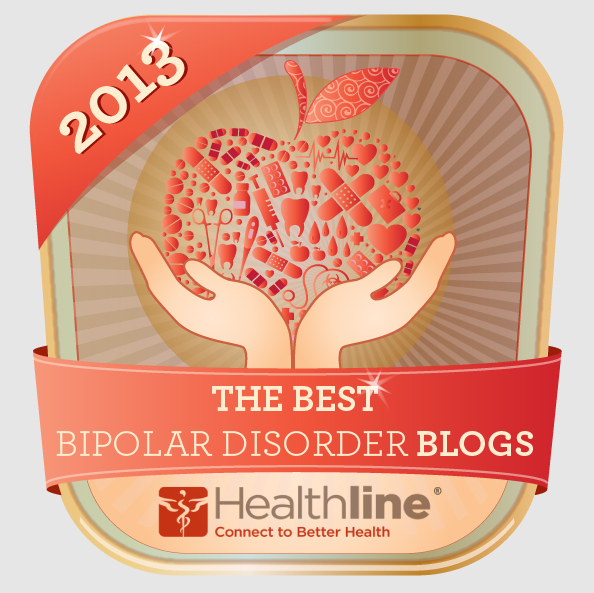 “Bipolar is just one part of me.” “You are brave and courageous.” “You are feeling good! You can get to this place again.” These are the post-its I see several times a day as I take medication for many things, including bipolar disorder. I’ve been thinking for a few days what it means to live with bipolar disorder, and these three post-its are part of the deal of living with bipolar. I am many things – compassionate, smart, funny, passionate, nerdy – and bipolar. And though bipolar colors ALL of my existence, it is just one part of me. It is easy for me to say “I am bipolar” instead of the more socially acceptable “I have bipolar.” What my mood and thoughts are doing, and the routines I use to contain them, shapes my whole life. I cannot escape my bipolar brain. When I’m feeling well, like right now I can see how there are parts of me that would be there even if I didn’t have bipolar, like a snarky sense of humor or being passionate about social justice. I have to be persistent, routinized, and brave Every.Single.Day. Each day I wake up to thoughts that second-guess my mental well-being and my ability to even face a day without causing harm to myself. Courageously I choose to get up and start the routine that will get the day off to a better start. Courageously I take my meds, brush my teeth, drink my coffee and check my calendar. Eventually I can face the day, if it’s a good day. Some days I can only think of suicide and can only feel anxiety and fear. On those days I have still made the choice every minute to keep on living. “Nevertheless, she persisted,” applies not only to U.S. Senators who keep talking despite pressure to shut up and sit down, but also to my choosing life day after day, moment after fearful moment of thoughts of death that won’t stop. I am brave and courageous. I am living in a euthymic phase right now – a good, stable, middle point of my moods. And I can get there again if/when I become depressed or manic again. I need the reminder both that bipolar is cyclical and that I am in a good phase. It’s time to take a look around! Smell the flowers and trees and other pollens I am violently allergic to. Play with my cat. Sip coffee. Really discover what I am capable of when I am feeling well! It’s time to enjoy this time I have, and trust that it will come again. What are some insights you have uncovered about living with bipolar, either from your own life, or from watching me live mine? The last couple days have been thankfully, gratefully, blessed with lower anxiety. So even though I still have suicidal thoughts, they don’t hook into the anxiety and become obsessive. They float in as any thought does, and they float out, blessedly. It’s such a huge relief! I’ve been busy doing nothing, and exercising occasionally, and moving forward with relearning some college algebra that should help when I start taking those science classes in the fall. I’ve been trying to read, but maybe I need to give up on this book. It’s just not getting anywhere. Or I can’t focus for very long, which is a feature I run into regularly. Maybe I’ll try another book for a while. My mood is a little low, but still in the balanced arena, I think. As happens when I’m depressed, I’m fatigued for hours after I wake up, despite jolts from coffee. And I cancelled on some times to get together with people, another sign of depression for me. I’m not convinced either way that I’m depressed or not depressed. Time will tell? Who am I in this new mental state? I really don’t know! I had my last ECT a month ago, a Month Ago! My mood is stable; my thoughts about death and suicide are not. They continue to come and go, intense sometimes, fleeting at others. I deal with them with some ACT (Acceptance and Commitment Therapy ) coping skills my therapist has me using. Sometimes those work to bring down my anxiety and miserableness. And sometimes not so much. He likes that I report back on how much skills work or not. I just want the thoughts to stop! But they don’t. Along with a mood that is in the middle – neither depressed nor manic – I have energy to get out of bed in the morning, and energy for each day. I’ve even somehow managed to stop waiting for the other shoe to drop, that I’ll end up in a suicidal depression again and end up in the hospital. I have optimism and hope for the future and hope that I can accomplish a goal set in the future. In a week I’m doing a training to be a facilitator for NAMI Connection support groups. Starting next week I will be the short-term facilitator of a small group I’m in. In May I’m going to walk in the NAMIWalks 5K, which means training and fundraising for the next 3 months. AND I applied to the community college near me to take a bunch of science classes I never got to take during my college years. The first class starts in June, and there are several things to do before then. What have I discovered about myself in this month of… competency, flexibility, stability? First, I’m learning to trust myself to hold a steady mood, despite thoughts that scare and annoy and aggravate. Second, I now know that part of the reason I’m doing better is because I have housemates. I know I can’t live alone. Where I will live or move is up in the air, but many wise people have advised that I spend some time adjusting to this new phase before making big changes. Third, I’m recognizing the traits and values that make me, me. Compassion, justice, volunteerism, friendship, for a start. I hope, hope, hope that I stay stable. I’m a little scared thoughts will take over. I want to take this time to get to know myself as a stable person – limits, weaknesses, strengths. I haven’t felt this good – ever! I’ve been in a mood state, untreated. Now? I have possibilities! I am still steady, stable, in the middle with my mood! I have more energy. I wake up ready for the day. I have hope that I can do things in my life, not just have energy for them now, but also not be interrupted by a hospitalization. I haven’t felt this good perhaps ever! But I continually have breakthrough bipolar symptoms. I have obsessive suicidal thoughts and visions of me killing myself in one of several ways. (Sorry to be graphic.) I get anxious over little stuff. I get overwhelmed with too much stimuli, like too much driving or being in line at the pharmacy with lots of people around. I wake up too early sometimes and can’t get back to sleep. The most distressing of the symptoms remains the intrusive, suicidal thoughts that are accompanied by such unhelpful thoughts as the world would be better without me, I don’t add much to anyone’s existence in any kind of unique way, and I would rather just check out and find eternal unconscious sleep. See? Unhelpful accompanying thoughts, besides visions of killing myself. Then today I heard the Matchbox 20 song “Unwell” on the radio, and I’m again realizing that I am sick. 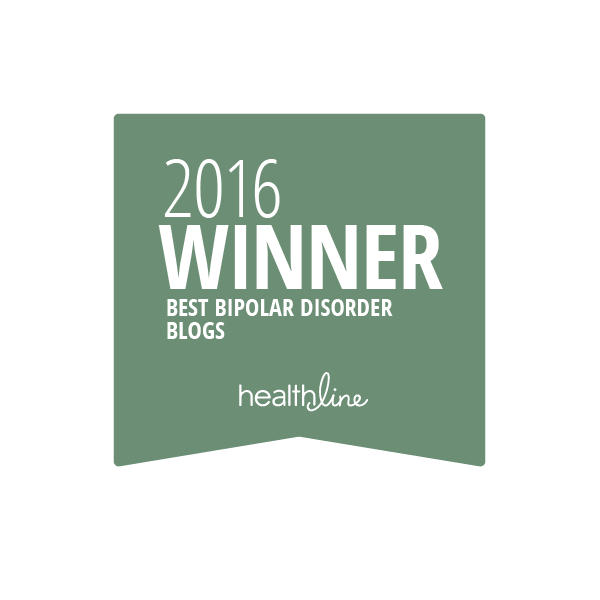 I have bipolar (and other medical and mental illnesses), and it doesn’t go away. I’m always making allowances for how my brain works, whether fighting against how hard it is to concentrate or remember, or fighting against intrusive or obsessive or earworm thoughts. Bipolar runs my life. But…my mood is stable now, for however long I get to have one. So, am I sick, or am I well? How is it that I have an even, good mood that lets me hope for a good future AND I have obsessive suicidal thoughts? AND near constant anxiety that breaks through regularly? And other symptoms? Am I sick, or am I well? You are feeling good! You can get to this place again! My first post-it says, “Bipolar is just one part of me.” I don’t believe that right now, but I used to believe it and maybe I will again. The second post-it says, “You are brave and courageous.” I believe that one finally, even after a couple friends have spent years telling me that. These post-its are signposts of health I want to follow. I added a third one only because it is so important. I have changed so much in the last 10 months since my move to Texas. Healthier, mood stabilized (for now), happy, motivated, energized. I feel I have to put that caveat in there since, as my therapist said, moods change. I can be honest that I will fluctuate. And my psychiatrist expects narrower swings. So the future might be closer to a healthy person’s mood changes. I have to tell myself it might be possible to have a positive future. My therapist reminded me that it’s not just the 23 ECT treatments that brought me here. I worked hard for this. I learned and practiced dozens of coping skills. I’ve been through dozens of medication changes. Each of my 40-something hospitalizations has led to increased health and stability. I have spent years in weekly therapy, and I have bared my soul to multiple psychiatrists. I cultivated caring and dedicated support systems. I could go on. The two sentences on my post-it contain all I have written here. This blog post will be one I return to, I hope. I showed up for my scheduled ECT this morning. And in the pre-screen I talked about how well I’m doing, back to baseline on everything. Somehow the conversation twisted and the PA asked if I even wanted a treatment today. Um, NO! I waited an agonizing 5+ minutes while she talked with the treating psychiatrist. They agreed I was doing well enough not to have a treatment! I’m to call in a week for a phone screen to see if I’m still doing well or if I need a treatment. If I’m doing fine, they will discharge me and I can get the port out of my chest (used to access a vein easily since IV’s are hard to get on me). Hooray! I celebrated my unexpected free day and good prognosis with a ginormous mocha from the coffee shop in the hospital lobby. I also saw my regular psychiatrist today to ask about the fine tremors I have developed in my hands. But, I got to gloat about how well I was feeling. And I was shocked to be doing so well that he wanted to see me next In Three Months(!). Even as I’m feeling well, and stable, and Good, I’m worried about the bottom falling out and plunging into suicidal depression for the millionth time. My doctor encouraged me not to worry about what might happen, and even to make a video or add to my mirror post-its that Yes, I was doing well. Something to help remember if (when?) things get bad, that I had been healthy and it would happen again. Why do I expect suicidal depression to come again? Just because it has been a companion I could count on? And I got as good as one could get at dealing with it healthily? How about I have no freaking clue how to be in a good space? I’m worried that the increased energy I feel is mania, and that the only way I have to express how good I’m feeling is to talk too much or to spend money. Both of those are things I do when I’m manic, yet I’m not manic. I just don’t know how to be healthy! What are behaviors You have when You are healthy? I did not go to the hospital for ECT this morning, for all the reasons given in yesterday’s post. I just don’t think the presence of suicidal thoughts that are part of my mind’s landscape on a normal day – given the lack of intent and concrete plans – warrants an ECT treatment. I’m not ruminating on suicide as I do when the pathology is present. Today I’m taking a look around the landscape of my thoughts and feelings in this new and dazzling place of “somewhere in the middle.” What does it look like to have a sad thought but not be depressed??? I don’t know! But I had one today. What is it like to feel content and happy but not be euphoric and taking risks??? I don’t know! Yet I would use those words to describe my mood today: content, happy. What else is going on in this mood state? I popped out of bed rather quickly this morning. I’m being more kind and helpful than ordinarily with grocery shopping and cooking and chores around the house. I made extra coffee just because instead of thinking I had no energy for extra anything. I’m noticing that I have negative self-talk about myself and that I don’t believe the negative things any more. How weird is that? A coping skill since diagnosis over 8 years ago has been positive self-talk and changing negative self-images and thoughts to positive ones. I have found this skill elusive most of the time. I just don’t believe the positive stuff. But today! Today and this week so far, I have only positive things to tell myself. Even when I notice something negative, I’m quick to do a reality check and change what I’m telling myself. What is this new persona, that I tell myself positive things about my image and personality and worth as a human? Why Do Some Choose to Die and Others Have the Will to Live?